In a collection of miscellaneous texts, a few pages survive of a copy of the 'Topographia Hibernica' ('Description of Ireland') by Gerald of Wales or Giraldus Cambrensis. Gerald (c. 1146-1223) was born at Manobier in Pembrokeshire, West Wales. He was a well-connected churchman and wrote his collection of material on Ireland when there with Prince John's expedition of 1184. Long considered a reliable source, it is less a history than a dramatically related narrative which includes legends and tales along with description. 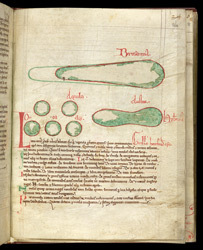 This simple plan illustrates a copy of the History and Topography of Ireland composed in 1185. Oriented with East at the top, and probably copied from a world map, it shows Great Britain ('Britannia'), Ireland ('Hybernia') and the Orkneys ('Orcades'). It resembles one in another manuscript in the British Library (Arundel MS. 14, f. 27v). Below it is a copy of Gerald's letter addressed to William (de Vere), Bishop of Hereford (1186-1199), of which only three other copies are known.